Lip Hemangioma: What is it? Photoshop and Facetune do so much to affect the kinds of people we see everyday online. It seems that everyone has perfect, flawless skin until you look around you at the grocery store or at a football game. Even then, you might see a sea of what appears to be perfect faces at first glance. It’s when we look closely that we normally notice the imperfections: the scars and birthmarks that set us apart from each other. Some of those imperfections help make us who we are, while others tend to serve as distractions. When you meet someone new, you want them to see you, not the large lesion on your face. Keep reading to learn more about some of these often-problematic lesions: lip hemangioma and venous lakes. A hemangioma is a kind of vascular tumor that can occur when we’re younger, and it can be confused with a birthmark due to its appearance. Though it is a tumor, don’t start worrying. Lip hemangioma is a benign tumor, and is only called as such because “tumor” refers to an irregular mass of tissue. A hemangioma is an irregular, abnormally dense group of blood vessels that occurs near the surface of the skin. It can resolve itself on its own after a few years, especially when it is found on younger children and babies. 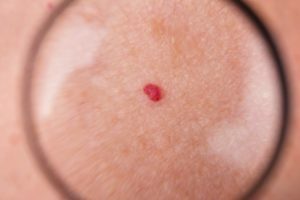 When Do I Need To Treat A Hemangioma? You might want to look into treatment for a hemangioma if it interferes with your child’s vital functions, like breathing, seeing, hearing, or elimination. In an adult patient, it completely depends on your level of comfort with the hemangioma. Many patients may elect to have the mark removed simply due to the lesion attracting too much attention, or interfering with their social life. Removing a hemangioma can be done with a laser treatment, over a fairly short appointment. Venous lakes are similar, but very different from lip hemangiomas, because they consist of just one dilated blood vessel. Remember, lip hemangiomas consist of a cluster of blood cells. Venous lakes are more often blue than red, since they consist of deoxygenated blood. Venous lakes can result from trauma to the area, prolonged sun exposure, or they may just show up without a specific reason one day. Venous lakes differ from hemangiomas in that they rarely go away on their own. Treatment is likely required to remove a venous lake if it is bothering you. If you are bothered or concerned about a lip hemangioma or a venous lake, call us today at (650) 285-4661 to schedule a consultation.